Nintendo has released the first DLC for Breath of the Wild and it’s not shirking on the new content. The DLC Pack 1, entitled “The Legend of Zelda: Breath of the Wild – The Master Trials”, is included as part of the Expansion Pass for Nintendo Switch and Wii U. That also includes three new treasure chests and a further DLC Pack expected to be released at the end of the year – in “Holiday 2017”. You can buy a digital code for £17.99 from “select retailers” such as Amazon.co.uk in the UK. It costs $19.99 in the US. That code can then be redeemed through the Nintendo eShop on the console itself. You can buy it through the game’s main menu, under the “Downloadable Content” section. Or you can visit the game’s Nintendo eShop page on the Switch, scroll down and purchase the Expansion Pass there. Nintendo Switch vs Wii U: What’s the difference? Trial of the Sword: A “certain sacred location”, which regular players will already be familiar with, now offers an all-new Trial of the Sword challenge. There are 45 rooms in which waves of increasing more difficult enemies need to be vanquished. Worse is that Link starts without any equipment or weapons. The reward is well worth it though, the Master Sword will be permanently powered-up after the challenge is complete (beforehand, it runs out of power occasionally and needs to charge again before use). Hero’s Path Mode: This mode shows a line of exactly where you visited in the last 200 hours of gameplay, displayed on the in-game map, showing your path through the adventure. New armour: Eight new treasure chests appear in Hyrule that contain new armour to collect, all based on previous The Legend of Zelda games. And that includes Majora’s Mask, oh yes. The second expansion pack is some way off, coming at the end of 2017, so details of what it will contain are yet to be revealed. However, we do know that it will add a “new dungeon”, an “original story” and “even more new challenges”. Apple CarPlay has finally gone wireless. After debuting the technology at CES this year, Alpine is now shipping the iLX-107, the first CarPlay receiver with support for wireless connectivity. And considering the tech world’s general disdain for wires and cables, it’s a surprise it’s taken this long to reach the aftermarket. The receiver (compatible with the iPhone 5 and later) lets CarPlay be accessed through the touchscreen and Siri voice control. You’ll get the full CarPlay experience: make calls, read texts, choose music and get real-time traffic updates. Plus, depending on your car you’ll get customized vehicle information too, such as park assist. There’s no longer any need for the proverbial Lightning cable: simply connect your phone via WiFi or Bluetooth. While CarPlay receivers have been kicking around for a while, this is the first to support wireless connectivity — a function that began development in 2015 but didn’t find an infotainment home until late 2016 when it was added to the 2017 BMW 5 Series Sedan. Despite growing demand for such systems, very few manufacturers have the tech built into their cars, so it’s still very much a novelty. Perhaps this is the argument for the iLX-107’s eye-watering $900 price tag. When you’re far from a cell tower and need to figure out if that bluebird is Sialia sialis or Sialia mexicana, no cloud server is going to help you. That’s why companies are squeezing AI onto portable devices, and Microsoft has just taken that to a new extreme by putting deep learning algorithms onto a Raspberry Pi. The goals is to get AI onto “dumb” devices like sprinklers, medical implants and soil sensors to make them more useful, even if there’s no supercomputer or internet connection in sight. “Every hobbyist who owns a Raspberry Pi should be able to do that,” Dekel said in Microsoft’s blog. “Today, very few of them can.” The problems is that it’s too expensive and impractical to install high-powered chips or connected cloud-computing devices on things like squirrel sensors. However, it’s feasible to equip sensors and other devices with a $10 Raspberry Zero or the pepper-flake-sized Cortex M0 chip pictured above. To make it work on systems that often have just a few kilobytes of RAM, the team compressed neural network parameters down to just a few bits instead of the usual 32. Another technique is “sparsification” of algorithms, a way of pruning them down to remove redundancies. By doing that, they were able to make an image detection system run about 20 times faster on a Raspberry Pi 3 without any loss of accuracy. However, taking it to the next level won’t be quite as easy. “There is just no way to take a deep neural network, have it stay as accurate as it is today, and consume 10,000 times less resources. You can’t do it,” said Dekel. For that, they’ll need to invent new types of AI tech tailored for low-powered devices, and that’s tricky, considering researchers still don’t know exactly how deep learning tools work. Microsoft’s researchers are working on a few projects for folks with impairments, like a walking stick that can detect falls and issue a call for help, and “smart gloves” that can interpret sign language. To get some new ideas and help, they’ve made some of their early training tools and algorithms available to Raspberry Pi hobbyists and other researchers on Github. “Giving these powerful machine-learning tools to everyday people is the democratization of AI,” says researcher Saleema Amershi. Mesh-networking kits, which use multiple access points spread around your house, are a great alternative to traditional routers for large and troublesome homes where a single powerful router won’t cut it. After spending over 50 hours testing nine mesh Wi-Fi networking kits in a large, complicated, multilevel home, we’re confident the Netgear Orbi kit is the best choice for most people. Our testing, however, also showed that most people will still be fine with our current router pick instead of mesh. You should consider a mesh-networking kit if you have a house that a single powerful router can’t cover, such as a large house (say, above 3,000 square feet), a small house with signal-killing interior walls (like lath-and-plaster, brick, or concrete blocks), or a house with a complicated layout. But before you toss out everything and get a mesh-networking kit, you should try moving your router to a central location, adding a wireless extender, or running Ethernet cable to inexpensive wireless access points. 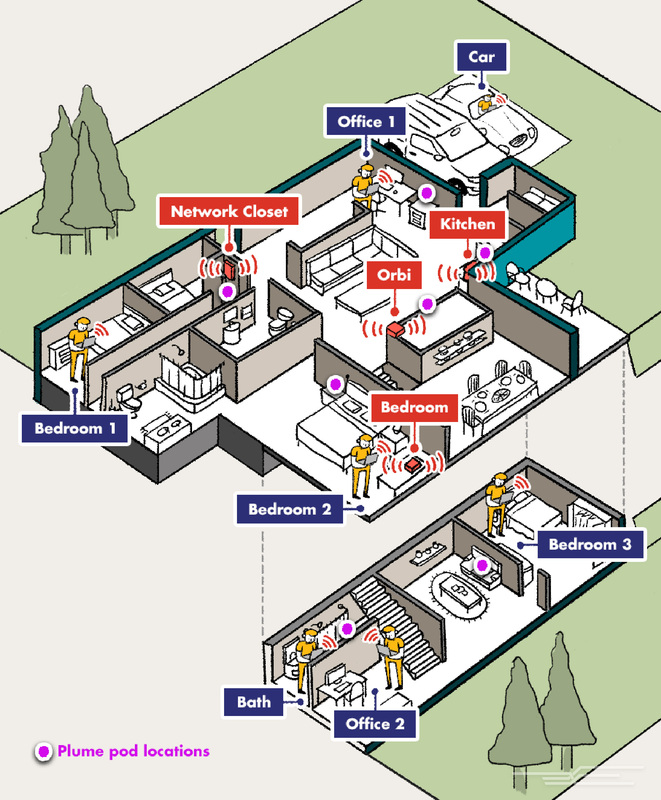 These approaches offer the benefits of the mesh-network kits, but at a much lower cost. For our first two rounds, we tested every home mesh networking kit we could get (not just-announced, in crowdfunding, or in preproduction, but actually available when we started testing). Our first round of testing included the Eero, Luma, and Netgear Orbi kits, as well as both the HD and (now discontinued) standard versions of the AmpliFi kit. 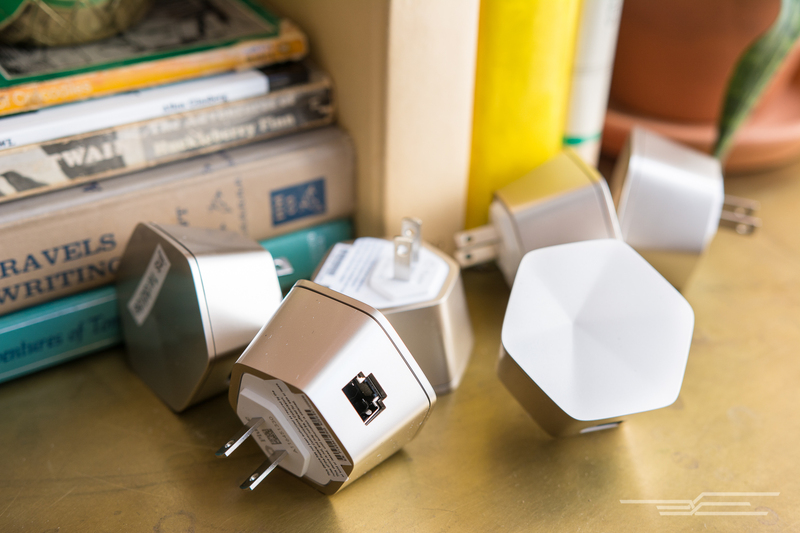 For our current round, we added the Linksys Velop, Google Wifi, Amped Ally, and Plume kits. To test coverage and performance, we set up each kit’s units in a challenging home environment. The two-story, 3,500-square-foot house we used is built into a hillside, with a foundation slab underneath half of the top floor. The foundation slab effectively kills any direct Wi-Fi signal from the upstairs networking closet to the bottom floor. We tested latency and throughput for each mesh kit a minimum of three times in each of the four corners in both floors, as well as inside a parked car in the driveway. We also tested usability by browsing random selections from the front page of YouTube on a smartphone in each of the test locations for a few minutes. Finally, we paid close attention to roaming. I wrote a script that made my test laptop “BING!” every time it roamed from one access point to another, or from one spectrum to another, and I gave the devices as much chance to network-roam on their own as possible. To learn about our testing procedure in detail, please see our full guide. Netgear’s Orbi RBK50 is the best Wi-Fi mesh kit for most people, because it covers all the bases in the simplest way. It ranked at or near the top of the pack for throughput, it’s easy to set up and use, it’s packed with advanced features, it has four wired Gigabit Ethernet ports, and, unlike most mesh kits, it still works without an Internet connection. 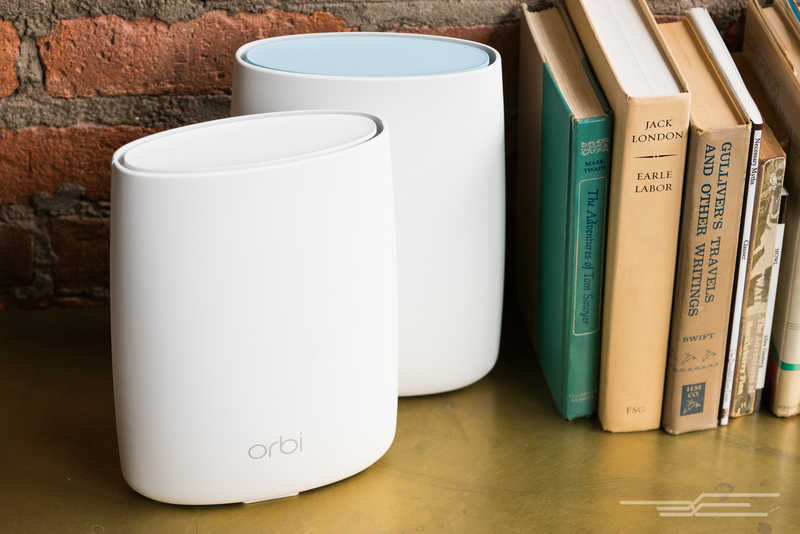 The Orbi is also one of the only kits we tested with a dedicated backhaul band for communication between the router and the satellite unit. Ease of setup is a pretty big deal with Wi-Fi mesh, because the placement of the units can be as important as which kit you buy. The fact that the Orbi kit has just two units instead of three, with dead-simple instructions—put the base unit where your Internet connection is, and the satellite in the middle of your house—will ease the technical anxiety of people who simply want to plug it in and get on with their lives. The Orbi is also the only kit we tested that can be set up with a local Web interface, instead of a cloud service or smartphone app. It works just fine with any Internet connection or even none at all. Orbi’s only real flaw is that it uses the same channels for all three radios on the router and satellite(s). This approach maximizes your chance of congestion and interference, indicating that Orbi might not be the best choice for people with a large number of devices. Eero was the first, and is still the most famous, mesh-networking kit. The system is physically attractive, technologically flexible, and well-established. 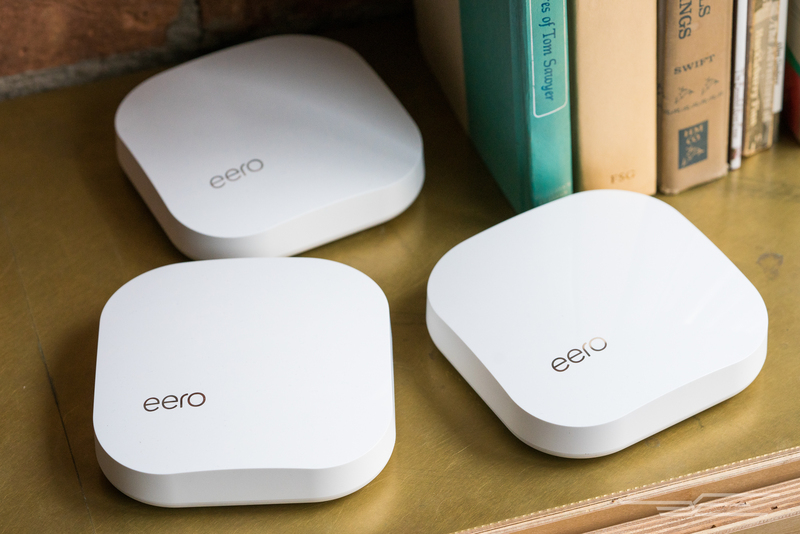 In our testing environment, Eero was reliable and easy to set up and use, and offers good throughput and range, along with serious expandability. You can also buy more Eero units and adopt them into your existing network, if your place is big enough and your pockets are deep enough to justify that. It’s a solid runner-up choice if Orbi is sold out or too expensive, or if you have a situation that needs multi-“hop” but you don’t want to try the relatively unknown Plume. Eero’s intuitive app lets you enable an “Internet pause” feature that makes it very easy to shut off Internet access—instantly or on a schedule—to get the attention of unruly kids, spouses, or roommates. The Eero system is extremely well-documented, too, in a style that doesn’t scare off network novices yet still gives technically minded people all the details they want. Plume takes a totally different approach to networking than Orbi does by prioritizing rock-solid, low-latency connections over high throughput. While every other mesh kit consists of two or three fairly high-power devices, a Plume network consists of a bunch of tiny, relatively inexpensive, low-powered pods that plug directly into wall outlets. Plume’s cloud optimizer software automatically organizes the pods into a complex topology, which should offer significant benefits for anybody with a large number of Wi-Fi devices or signal-blocking obstacles in their house. Despite a given pod frequently needing two or even three more hops to communicate with the router than competing units, the Plume system had the lowest latency of any kit I tested. That’s seriously impressive, and it helps devices roam more easily and accurately than any other kit we tested. Plume’s smartphone-controlled interface is simple, intuitive, and sufficient for the typical home, but—like all the smartphone-controlled mesh kits we tried, and unlike Orbi—it doesn’t go deep into the technical details. If you want to go nuts with advanced functions, you should plug the main Plume pod into your existing router and put the kit in bridge mode. Starcraft’s long-overdue facelift will make its debut on Monday 14 August. The remastered version boasts a raft of enhancements including 4K resolution, improved sound and rebooted dialogue, all designed to make the game look a bit more shiny and polished, while essentially remaining exactly the same. Priced at $14.99/£12.99 and available for Windows and Mac, the classic strategy game also features a new matchmaking and leaderboard system, player profiles and the ability to save to the cloud, all while maintaining the same gameplay that’s somehow resulted in a two-decade-long fan obsession. Don’t worry, puritans. You’ll be pleased to hear it’ll be possible to switch between the original and the remastered game at the touch of a button, while players embracing the makeover can pre-order through the Blizzard Shop to get their hands on three unique building skins for use in the remastered version. In 2015, RadioShack filed for bankruptcy and shortly thereafter co-branded around 1,400 of its remaining stores with Sprint. Just over two years later, RadioShack has filed for bankruptcy again and a group of its creditors says it’s largely Sprint’s fault. In a lawsuit filed this week, the creditors claim that Sprint didn’t follow through with providing inventory and staff to the shared stores and used information from the partnership to open 200 competing stores near RadioShack’s most successful locations. The lawsuit says that by doing that, Sprint destroyed around 6,000 RadioShack jobs and prevented the chain’s recovery. The suit is seeking $500 million in damages from Sprint, who has gone on to make other partnerships since its one with RadioShack. Sprint, owned by SoftBank, bought a 33 percent stake in Tidal earlier this year and is reportedly in discussions to make a deal with Charter and Comcast, which has put ongoing talks of a merger with T-Mobile on hold. A spokesperson for Sprint said the company would be fighting the lawsuit and was disappointed by the creditors’ claims. On June 30th, 1908, more than 770 square miles of remote Russian forest were obliterated from the face of the Earth when a relatively small meteor, estimated at only around 400 feet across, unleashed 15 megatons of energy above the Stony Tunguska River. One hundred and nine years later, humanity knows precious little more about the dangers that lurk within our solar system than we did in 1908. But a recently founded “global day of education” aims to bring the existential threat that space rocks pose to the forefront of our collective consciousness. “Asteroid Day” is a UN-sanctioned event held every June 30th, the anniversary of the Tunguska incident, since 2014. 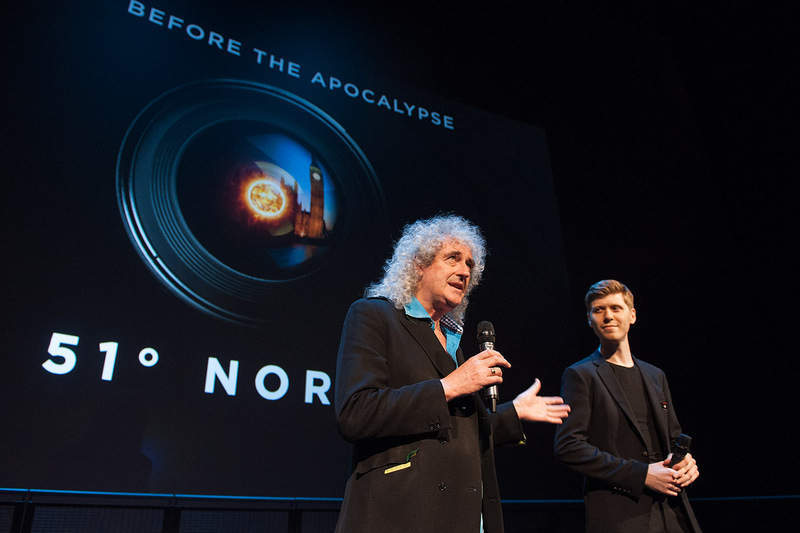 That was when former Queen guitarist and now astrophysicist Dr. Brian May teamed up with Rusty Schweickart and Dr. Ed Lu, a pair of former NASA astronauts and current proprietors of the B612 Foundation, along with Danica Remy and film director Grigorij Richters, to form the Asteroid Day Foundation (the ADF). While the B612 group seeks to ultimately develop methods of deflecting dangerous asteroids before they stray into Earth’s path, Asteroid Day works to simply increase our ability to detect incoming threats before it’s too late. Specifically, the ADF advocates for improving our asteroid-spotting capabilities by a factor of 100, which would enable astronomers to more quickly identify and track hundreds of thousands of the estimated one million near-Earth objects (NEOs) that are floating around our neck of the galaxy, rather than the thousand or so that we currently do. Asteroid Day festivities are largely decentralized. Hundreds of independently organized events are hosted in museums, schools, theaters and libraries across 72 countries and five continents under the Asteroid Day banner. In the three years that the event has been held, the number of events has doubled annually, from 250 the first year to 500 last year. This year, the ADF estimates that there will be closer to 1,000 gatherings going on. These include a number of regional events, such as a panel discussion being held at Imperial College in London, planetarium shows at the University of Nebraska, and “Asteroid Day walks” held in various cities throughout Pakistan. Additionally, the ADF is teaming with Discovery Channel to air a 24-hour livestream of asteroid-centric content. Even NASA is getting in on the fun. As part of a star-packed astronomers’ panel being held at the University of Arizona, researchers from NASA’s OSIRIS-REx mission (“Origins, Spectral Interpretation, Resource Identification, and Security-Regolith Explorer”) will be discussing their efforts to acquire and return to Earth the first physical samples of an asteroid. As of the publication of this story, the 20-foot-long OSIRIS-REx spacecraft is in orbit around the sun, awaiting the moment when Earth’s and Bennu’s orbits overlap and then using the planet’s gravity well to slingshot to within range of the asteroid. This should be sometime in September. Once the spacecraft and the asteroid are within visual range, approximately 1 million miles from each other, the OSIRIS will spend the following two years mapping and surveying the asteroid with its suite of visual cameras and lidar sensors. They’ll examine the space rock’s surface in microscopic detail, determine its chemical composition and plot out a safe space for the spacecraft to get close enough to collect a sample from it. The OSIRIS-REx has a clever means of doing this: It will extend a boom arm, dubbed the Touch-and-Go Sample Acquisition Mechanism (TAGSAM), which will “phoof” the surface with a puff of nitrogen, stirring up anywhere from a few ounces to a few pounds of material for collection. Anything the TAGSAM grabs will be loaded into a return capsule and blasted back toward Earth on a 2.5-year return journey. The rest of the OSRIS will return to its solar orbit, and, depending on how much fuel it has left, could be repurposed for future survey missions. The OSIRIS-Rex mission may well tell us where we came from, but it’s also doing important work to help ensure we stay here. While the 1,600-foot diameter Bennu asteroid isn’t big enough to wipe out life on Earth should it hit, which it may do in the late 22nd century, the impact would still mess us up real bad. Given that the Tunguska meteor, a quarter the size of this one, managed to wipe out an area the size of Jacksonville, Florida (America’s largest city in terms of acreage), Bennu could conceivable take out the better part of an entire state. The human cost alone would be utterly catastrophic. Luckily Bennu, like other asteroids, is subject to non-gravitational forces such as the Yarkovsky effect. That’s when the side of the asteroid facing a star absorbs solar radiation and heats up. As the asteroid rotates, the absorbed energy is emitted as thermal photons which generate momentum, redirecting the object ever so slightly as it travels through space. When that happens, asteroids will either be shunted out of the solar system entirely or fly into the sun unless their trajectories are influenced by another celestial object. “Some time in the past [Bennu] has just probably had some encounter with the Earth… because its orbit is so closely tied to the Earth,” he continued. Instead, Rizk envisions future space explorers using passing asteroids as celestial gas stations. “The nearest asteroids have the ideal combination of potential resources both in terms of volatiles and metals and all the rest of the stuff we need — oxygen — and accessibility.” And since the latest federal budget has effectively killed NASA’s asteroid redirect mission, it’s not like we’re going to be making artifical near Earth objects of our own any time soon. Music fans of a certain generation will remember Cash Money Records’ charmingly kitschy album art. Twenty years later the record label is capitalizing on nostalgia with the Cash Money 20th Anniversary app. If you’ve ever wanted to put your face on a Hot Boy$ album, this app will help you live out that fantasy. There are 20 stickers to dress your photo with, and even a Birdman and Lil Wayne tattoo pack to complete the look. As Billboard writes the first sticker pack is free, but everything else will run you $0.99 each. Need more from the free app? You can stream 15 videos from Cash Money artists and access commentary tracks and interviews with those involved with producing the clips. It’s available now on iOS, and the label promises it’ll go wide on other platforms on September 1st. In August 2012, iOS users began noticing that the default YouTube app had been removed from Apple’s software in iOS 6 Beta 4, becoming permanent with the public debut of the software in the fall of 2012. For the five years prior, YouTube was a mainstay on the iPhone, launching as a default app on iPhone OS as far back as the original iPhone in 2007. Animosity between Apple and many Android smartphone makers has been well-documented over the years, becoming abundant in 2012 through an ongoing lawsuit related to Apple’s suing of Samsung for copying the iPhone design with Android devices, as well as an Apple lawsuit aimed at Google-owned Motorola focusing on Slide-to-Unlock. Now, in a series of Tweets, former YouTube employee Hunter Walk has said that it was YouTube and Google’s decision not to renew an agreement with Apple for YouTube on iOS, so that the company could “take back control of our app” (via Business Insider). Walk sent out nearly one dozen Tweets on the topic last night, starting off by explaining how Apple approached Google for YouTube on the first iPhone, Apple’s control of building the app, the lack of an official “YouTube” name on the icon, and the overall success of the app as a way to entice customers to buy an iPhone for video streaming. When the license agreements ended five years later in 2012, Walk said YouTube’s time to take back the app came, so the company — “still operating pretty independently from GOOG at that time” — made its move. Walk went on to Tweet that the decision paid off, with most consumers reinstalling the YouTube app from the iOS App Store upon noticing that the default app had disappeared. Google remains the default search engine on iOS devices, and in 2016 it came to light that Google paid Apple $1 billion in 2014 to retain that status on iPhones and iPads. In 2012, Apple removed another default Google app from iPhone — Google Maps — and replaced it with Apple Maps in iOS 6. Dissolving circuit boards could be used in the military, or in more conventional use-cases like hospitals, too. The idea of a circuit board that dissolves the moment it’s cooled totally sounds like something out of the Mission: Impossible movies, or maybe a mystery heist flick where a rare computer disappears after being removed from its air-conditioned safe. In fact, it sums up the work being done by researchers at Vanderbilt University, described in a new paper published in the journal ACS Applied Materials & Interfaces. What they’ve been working on is a way of building transient electronics that come apart when you stop heating them. These nanowires — spun using a cotton candy machine — are embedded in the polymer, which holds the network together so that they are touching one another and therefore produce a path to conduct electricity. Should the polymer dissolve, there’s nothing to hold the nanowires together. As a result, the network falls apart, the nanowires do the same, and the conductive path is lost as the entire system disintegrates. So far, so intriguing. But why on earth would you want a dissolving circuit board? As suggested earlier, secretive operations could be a legitimate use-case. The heat supply could be a battery powering a heater, or even the body temperature of a soldier on whose body a top-secret circuit has been implanted. If the battery is lost, or the body heat is no longer available, the circuit vanishes. We guess the second one makes good sense. We still dig the Mission: Impossible one the most, though!